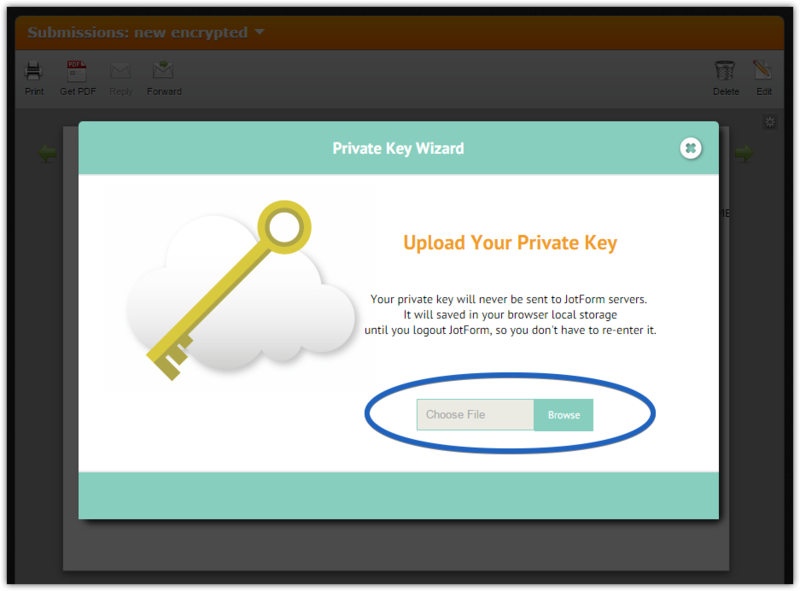 To be able to see encrypted data you will need to upload your Private Key file. 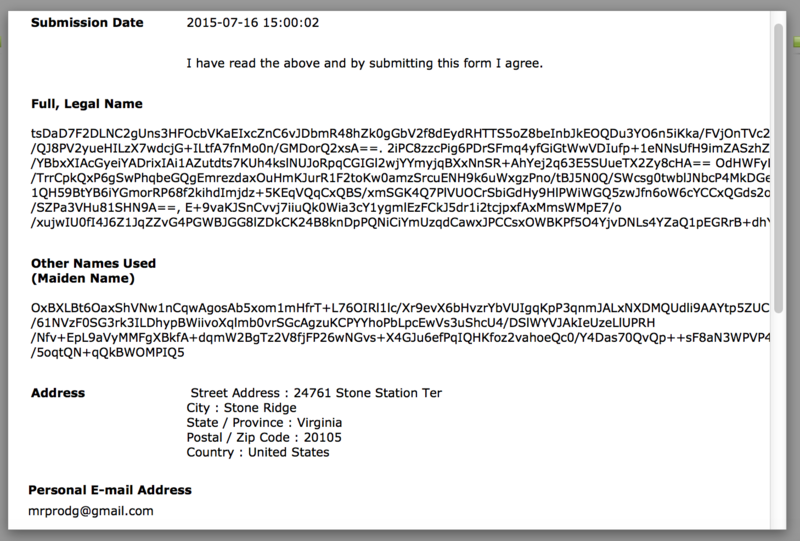 Note that we do not decrypt data on the Grid Listing at the bottom of the submissions page. If you uploaded your Private Key file, but submissions are still encrypted, it is most likely that your Private Key is outdated. 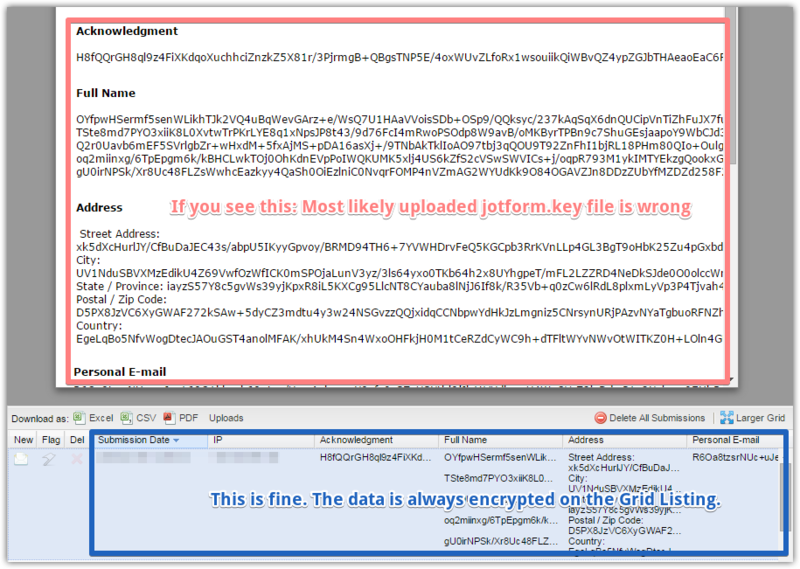 Are you currently facing the issue with encrypted Grid Listing or the whole submissions page at the moment? Then how do I get a new or correct jotform.key file???? You should have provision for this - people's computers die, get stolen, etc. and will need a new jot form.key file. I would like an answer that is acclaim productive and helpful to me and my situation! And I cannot see any submission on any encrypted forms (NOT JUST GRID view). I understand that grid view is not available at this time. As far as I understand, we do not store Private Encryption Key on our side, so this is essential to keep such file in a secure place. Please try to find the jotform.key file on your computer. If you downloaded that file multiple times, you will need to use the most recent file. First of all, check the Downloads folder on your computer to see if the key file is there. On Windows it can be accessed with the next path in Explorer. 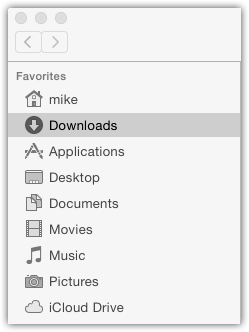 And on Mac with Finder. If you found the key and need to re-upload it to your account we can provide you with instructions on how to remove current key file from a browser local storage. Can you please provide a instructions on how to remove the key and access to the screen to enter a different key. I only have one encryption key in my downloads, which is the one I tried to use today. And the one my associate tried using on his computer. You have to have a way to set-up or send request a new key, right??? It is probably possible to create a new private key file, but I think that new file will not decrypt currently encrypted entries. To remove current key from the browser we will need to clear browser local storage. Please follow the next steps. 1. 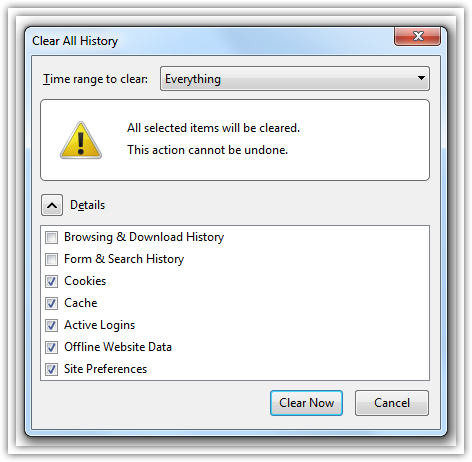 Press Ctrl-Shift-Del to open the Clear All History menu. 2. Make sure you have selected Cookies and that the time range is set to Everything. 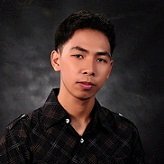 Reload submissions page, and you should be asked to upload the Private Key file again. Okay now I can see most info. On almost all submission only 1 or 2 piece are still encrypted but I can see everything else. On a few of the submissions, only partial information is showing (Date of Birth and only I only see the month). 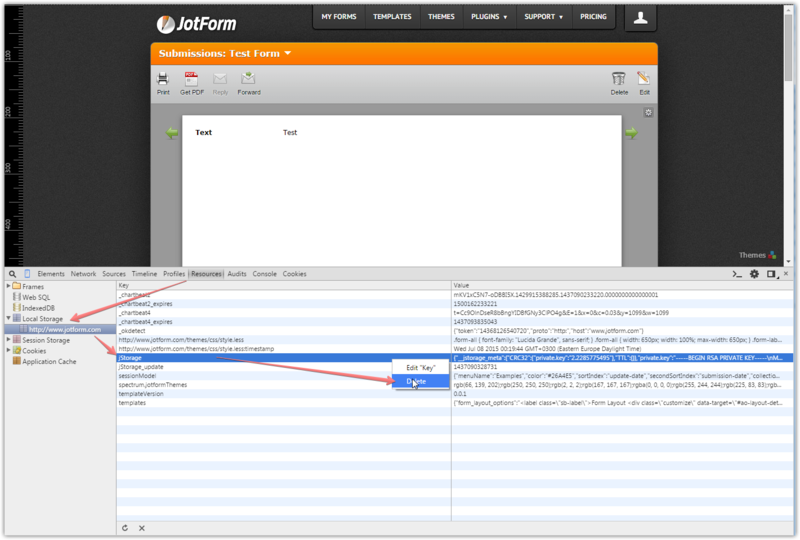 Are you referring to this form - http://www.jotformpro.com/form/51965597604973? I noticed that you have set Encrypt Form Data setting of the form to "No" and there are still submissions that are encrypted. I just want to confirm if this is what you are reporting? If you are referring to a different form, please provide the link or name of the form in question so we can further check the issue. Yes, this is the correct form. I had to change the setting to not encrypt the form due to the extensive issues the new encryption process has created in our daily business operation proceesses. I cannot afford to continue to have information come in from our submission this way (incomplete if at all). It has affected 2 forms thus far. Now I can see most info. On almost all submission only 1 or 2 piece are still encrypted but I can see everything else (it varies by individual submission). On a few of the submissions, only partial information is showing (Date of Birth -only I only see the month). @ICForms, I will report this to our second level, you will be notified via this thread when there is a resolution. I'm having this issue as well, I never set it up to be encrypted and I never received a private key. I now have a client who is trying to submit a contract and it's not allowing her to do so.